A European Union left and the Greek flag wave above the ancient Parthenon temple, at the Acropolis Hill, in Athens. IN THE PAST few months Greek Prime Minister George Papandreou passed new measures that cut wages and raises taxes, to help Greece meet deficit targets necessary for its next tranche of loans. Protesters took to the streets to oppose the measures, with violent clashes on the streets of Athens. When ECB president Jean-Claude Trichet announced that Greece most likely will receive the next round of funding European markets barely reacted to the news. But the rest of Europe still needs to approve the new bailout agreed in July. 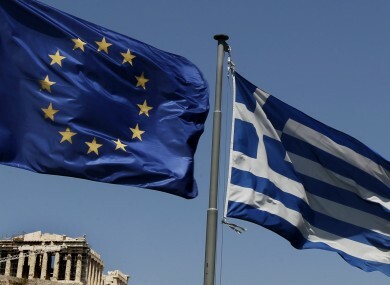 If there is no consensus, Greece will likely be unable to pay its bills, and will default on its debt. If that happens, who will get slammed? Email “Explainer: If Greece goes bust, who gets crushed?”. Feedback on “Explainer: If Greece goes bust, who gets crushed?”.